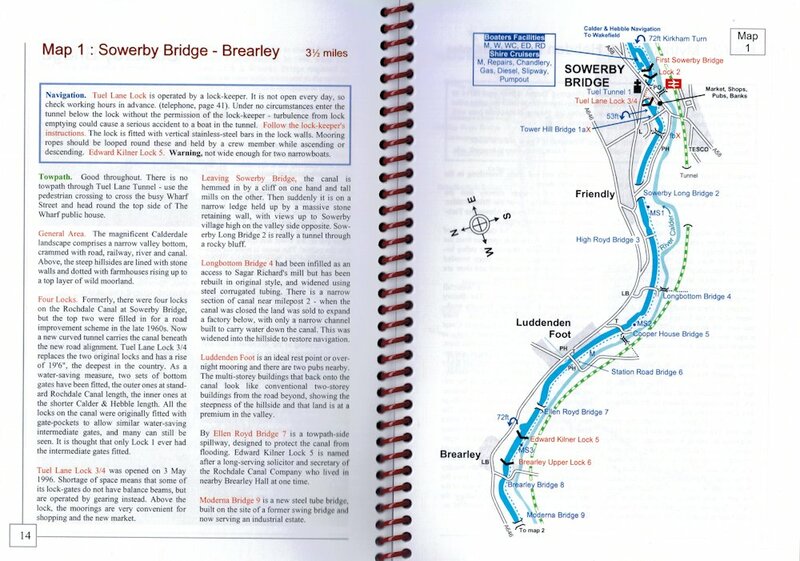 No two guides or maps cover exactly the same ground, and of course they are written and presented in different styles, but they all show the navigational features and facilities that you need. Check on the list below which publications cover the waterways you plan to travel. Click on the pictures to see a sample. To order guides, please use the online shop; or you can print our order form and post to us; or give card details over the phone. Prices include packing and first class UK postage; overseas postage £1.00 per item extra. Guides with an 'add to cart' button come from us. Those with a 'Download' come direct from our supplier. For routes further afield, please ask us about other guides. Please note that pubs change so frequently that the guides, despite every care and frequent updating, may be wrong. If in doubt, ring ahead - phone numbers are on our pubs page, which we keep as up to date as we can. Our online shop is provided by PayPal. 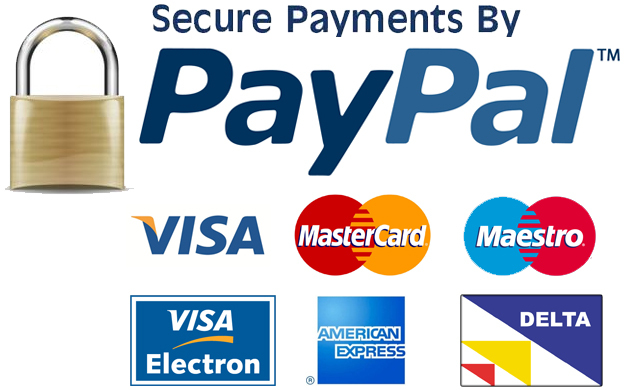 You can pay with a card, or using your own PayPal account. 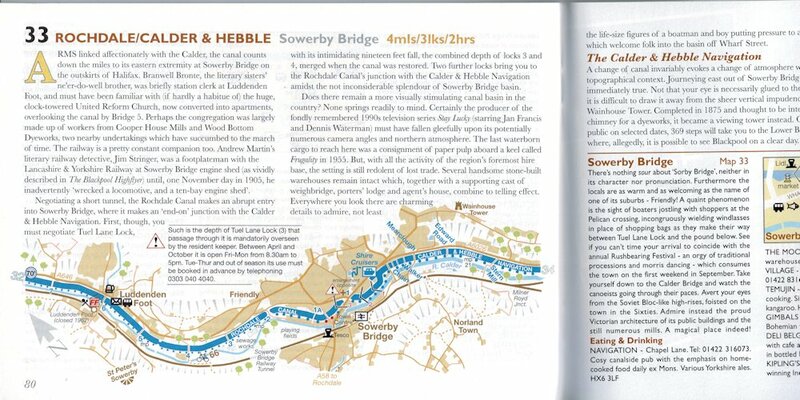 Small books with strip maps alongside a detailed description of the route, with well-chosen photographs. They have 2 inches to 1 mile maps. Very colourful, with clear maps, beautiful photographs and an engaging and amusing narrative. Card cover. Written by a leading authority, and printed to order, to incorporate the very latest revisions. They have good maps, informative text and many pictures. Spiral binder with clear plastic covers. The maps are genuine OS ones and point north. The text is detailed, informative and well illustrated. Spiral binder with card covers. These are what they say, so give a good overall feel for a route. They are not too big to handle. Real maps with the waterway superimposed. 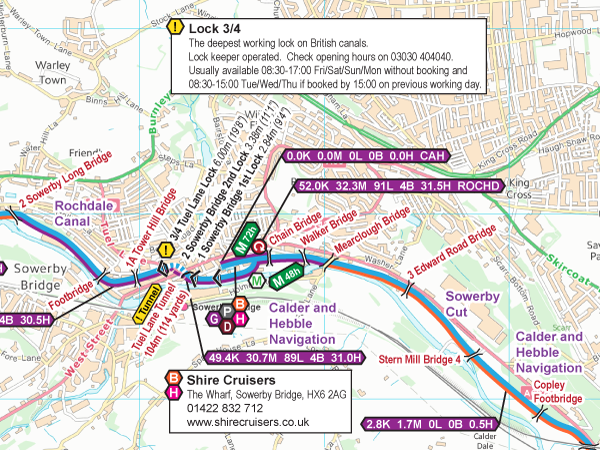 Locks, boatyards and navigational info are shown. The maps give lock/mile counts and cruising times. There is no descriptive text. 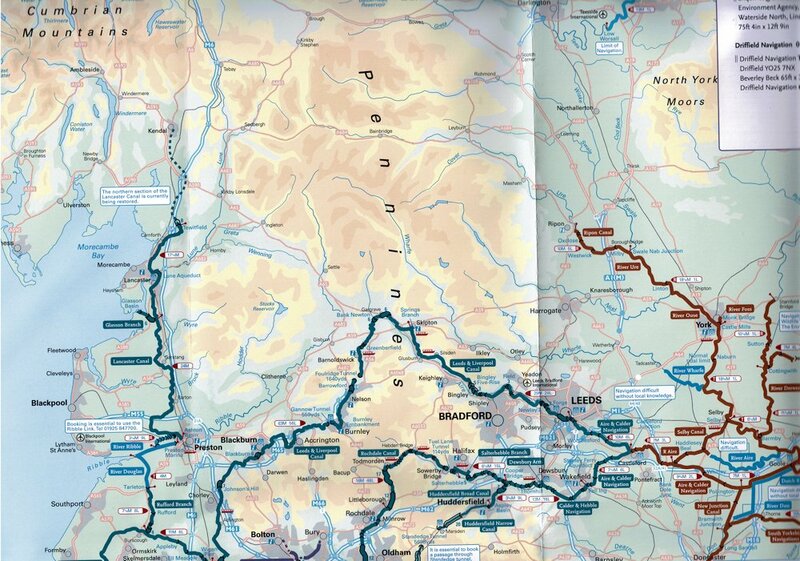 Available in two formats: to view and print; or to use as an app so that your device's GPS always puts you on the map. 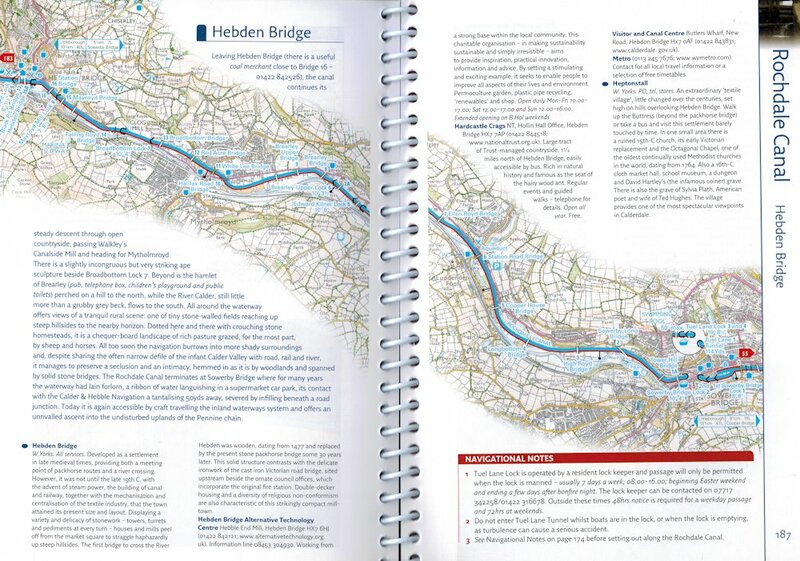 You can choose from versions which cover 7 or 14 day holidays from Sowerby Bridge; or journeys on the Leeds & Liverpool. 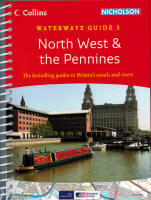 Buy direct from Waterway Routes using the links below. Download the map onto your smartphone or tablet. GPS moves the map as you travel. This works well on a phone, and is stunning on a tablet. Works on Windows computers, Android and iPhones/iPads (does not yet work on Windows phones and Apple computers). 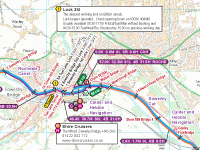 Needs MemoryMap to be loaded first (free 30 day trial; full licence £15.00; frequent discounts). View on screen or print out before your holiday. 35 A4 pp (7 day) or 79pp (14 day). Scale 3 inches to 1 mile when printed A4; 2 inches to 1 mile A5; variable on device. Approx. 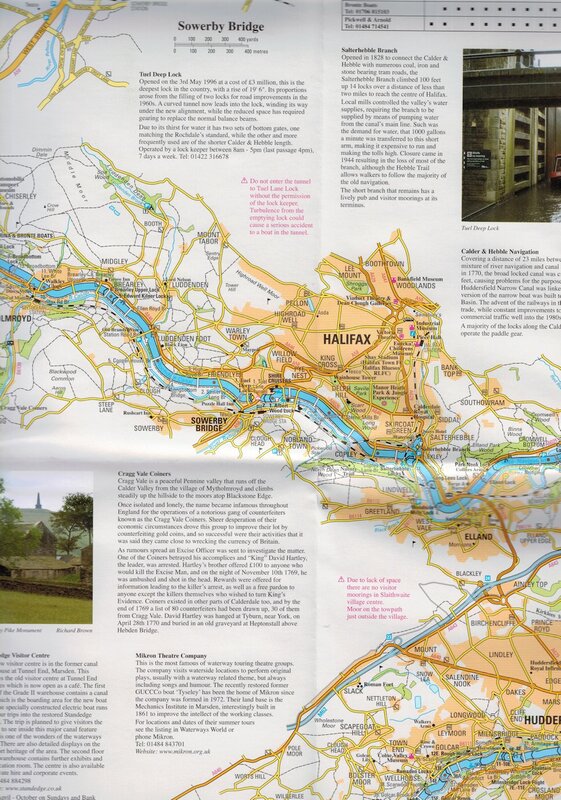 1:50,000 (1¼" to 1 mile), full colour and with a lot of informative text and pictures, plus town centre plans. Approx. 1 inch to 1 mile, full colour and with a lot of informative text and pictures, plus town centre plans. 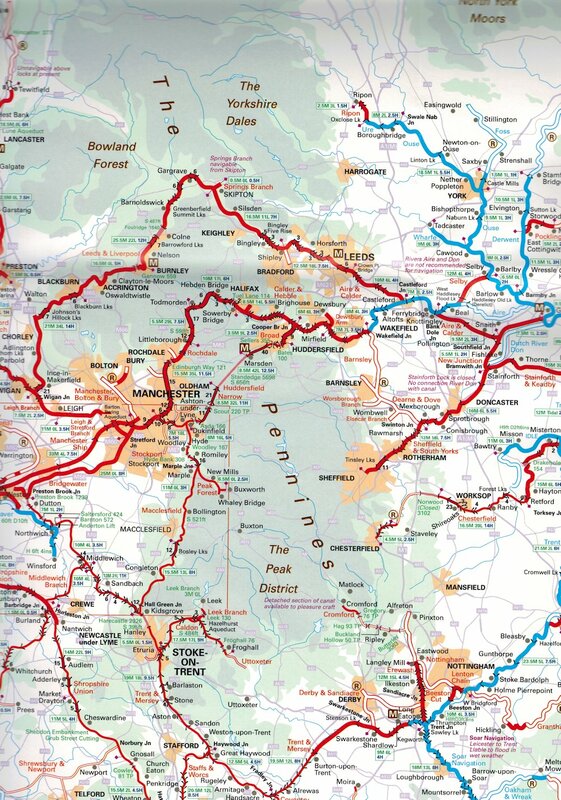 Large scale map of the whole waterways system.